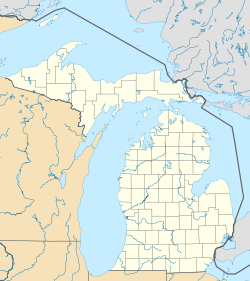 Northville is a city located in and divided by Oakland and Wayne counties in the U.S. state of Michigan. The area is a suburb of Metropolitan Detroit. The population was 5,970 at the 2010 census. Most of the city is in Oakland County and is surrounded by the city of Novi, while the other part is in Wayne County and is surrounded by Northville Township. Northville is served by Northville Public Schools. The city is located 21 miles (34 km) northeast of Ann Arbor and 29 miles (47 km) northwest of Detroit. Northville was first settled in 1825, was incorporated as a Village in 1867, and as a City in 1955. It was originally one of two communities within Plymouth Township, until Northville Township split off to form its own township in 1898. The first land patent in the Northville area was granted to Gideon Benton in 1823 where Cass Benton Park is currently located. The first settlers did not arrive, however, until 1825. Many of these first settlers were originally from New York State, but came from the nearby, already settled Plymouth community to Northville. Some of the first settlers were Alanson Aldrich followed by Alvale Smith, who sold his property to John Miller. Miller built the first mill in Plymouth Township, which Northville was a part of for over 70 years, sometime between 1825 and 1828 where Mill Race Historical Village is now located. Many employees of the mill then began to build their houses near it. Northville got its name by being north of Plymouth. In 1827, Northville was home to a post office, Gideon Benton being the postmaster. Also in 1827, a medical practitioner, J.F. Davis, became the first resident doctor in Northville, and a tailor, tavern, shoe shop, and two blacksmiths were set up in town. Many of Northville's first settlers' surnames are used as street names today. These include Rufus Thayer Jr. (Thayer Blvd. ), Joseph Yerkes (Yerkes St.), Daniel and Samuel Cady (Cady St.), William Dunlap (Dunlap St.), and many other settlers. The first church was constructed by Methodists in 1836. Northville continued to grow throughout the Victorian era. This is evident in the architecture around downtown where many homes are in the Queen Anne style. Northville's Victorian heritage is celebrated every September in the Victorian Festival, which was recently rechristened the "Heritage Festival". The first schoolhouse in Northville opened in 1853 and was taught by Jacob Ramsdell. Northville was incorporated as a village in 1867 from a portion of Plymouth Township. Henry Ford purchased a factory in Northville and moved machinery from plants in the area to the factory in 1919. Known as the Northville Valve Plant, the plant was rebuilt in 1936, and enlarged in 1956. The plant provided valves for every Ford, Mercury, and Lincoln vehicle, except for the Lincoln Continental, until closing and being sold in 1981. The building now houses offices and a health club. In 1925, the Penniman-Allen Theater opened downtown and remained open through most of the 1950s. The theater eventually closed, but opened again in 1978 as the Marquis Theater and is now home to live children's theater. When Northville was more rural, skiing was popular and tournaments were held often. In 1944, Northville Downs opened as the first nighttime harness racing track in Michigan. The Downs were built on the site of the former Wayne County Fair, where Joe Louis trained in 1939 for his World Championship later that year. Northville Downs has been in continuous operation since 1944, and is located at the corner of Center Street and 7 Mile Road. The city was incorporated in 1955 along the boundaries of the Village of Northville. The Village of Northville included portions of Novi Township in Oakland County and Northville Township in Wayne County. Over the next several years, the city boundaries expanded through annexation of portions of Novi Township and the Village of Novi both east and west of the city and north of Baseline Road. The city's northern boundary was fixed by the incorporation of the Village of Novi into the City of Novi in 1969. The city has also annexed small portions of Northville Township, the most recent of which was an expansion of the Rural Hill Cemetery. Northville Township's status as a Charter Township generally precludes the City from annexing any significant portion of the Township. The most recent annexation was permitted by the Township in order for the city to expand the city-owned and operated cemetery. In 1889, the Ladies Library Association was organized by Mary Lapham, and had 1,200 books and 150 members by 1892. The library was located in the former Young Men's Hall until 1964, when it moved to the then-new City Hall temporarily. In 1975, the library moved again temporarily to the Northville Square Mall before moving back to City Hall in 1980. In 1996, the brand new Northville District Library opened. According to the United States Census Bureau, the city has a total area of 2.07 square miles (5.36 km2), of which 2.05 square miles (5.31 km2) is land and 0.02 square miles (0.05 km2) is water. In 2007, the median income for a household in the city was $98,054, and the median income for a family was $123,509.). Males had a median income of $75,126 versus $41,343 for females. The per capita income for the city was $43,454. About 1.0% of families and 1.6% of the population were below the poverty line, including 2.2% of those under age 18 and 2.2% of those age 65 or over. As of the census of 2010, there were 5,970 people, 2,596 households, and 1,643 families residing in the city. The population density was 2,912.2 inhabitants per square mile (1,124.4/km2). There were 2,767 housing units at an average density of 1,349.8 per square mile (521.2/km2). The racial makeup of the city was 93.7% White, 1.6% African American, 0.1% Native American, 2.6% Asian, 0.6% from other races, and 1.4% from two or more races. Hispanic or Latino of any race were 2.2% of the population. There were 2,596 households of which 27.7% had children under the age of 18 living with them, 53.8% were married couples living together, 7.4% had a female householder with no husband present, 2.1% had a male householder with no wife present, and 36.7% were non-families. 32.3% of all households were made up of individuals and 11.4% had someone living alone who was 65 years of age or older. The average household size was 2.29 and the average family size was 2.94. The median age in the city was 45.3 years. 22% of residents were under the age of 18; 5.5% were between the ages of 18 and 24; 22.1% were from 25 to 44; 34.3% were from 45 to 64; and 16.1% were 65 years of age or older. The gender makeup of the city was 47.9% male and 52.1% female. As of the census of 2000, there were 6,459 people, 2,720 households, and 1,795 families residing in the city. The population density was 3,239.1 per square mile (1,253.2/km²). There were 2,801 housing units at an average density of 1,404.7 per square mile (543.5/km²). The racial makeup of the city was 96.11% White, 0.39% African American, 0.19% Native American, 1.86% Asian, 0.09% Pacific Islander, 0.59% from other races, and 0.77% from two or more races. Hispanic or Latino of any race were 1.64% of the population. In more detail, 18.7% were of German, 14.1% were of Irish, 12.3% were of Polish, 10.1% were of English, and 7.4% were of Italian ancestry. There were 2,720 households out of which 29.9% had children under the age of 18 living with them, 58.3% were married couples living together, 5.8% had a female householder with no husband present, and 34.0% were non-families. 30.2% of all households were made up of individuals and 9.7% had someone living alone who was 65 years of age or older. The average household size was 2.36 and the average family size was 2.97. In the city, the population was spread out with 23.8% under the age of 18, 4.7% from 18 to 24, 29.7% from 25 to 44, 29.2% from 45 to 64, and 12.6% who were 65 years of age or older. The median age was 41 years. For every 100 females, there were 92.1 males. For every 100 females age 18 and over, there were 90.0 males. Henry Ford, at one point lived in Northville. Jennifer Granholm, Governor of Michigan, lived in Northville prior to being elected and moving to Lansing. ^ Muniweb. "Charter, City of Northville, Michigan (MI)". northville.mi.us. ^ "Race, Hispanic or Latino, Age, and Housing Occupancy: 2010 Census Redistricting Data (Public Law 94-171) Summary File (QT-PL), Northville city, Michigan". U.S. Census Bureau, American FactFinder 2. Retrieved August 19, 2011. ^ "History". Northvillemarquistheatre.com. Retrieved 2009-10-10. ^ "Website - Art in the Sun". Northville.org. Retrieved 2009-10-10. ^ "Website - Farmers Market". Northville.org. Retrieved 2009-10-10. ^ "Website - Northville Grub Crawl". Northville.org. Retrieved 2009-10-10. ^ "Website - Victorian Festival". Northville.org. Retrieved 2009-10-10. ^ "Website - Fire and Ice". Northville.org. 2009-01-31. Retrieved 2009-10-10. 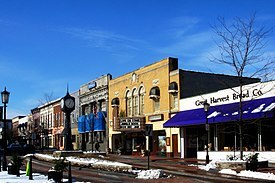 Wikimedia Commons has media related to Northville, Michigan. This page was last edited on 15 April 2019, at 02:36 (UTC).